A week ago we brought you breaking news involving a Ghanaian in Philadelphia, USA, who had a car accident and died. Sources close to Mr. Charles Nimmo Mensah (aka Mr. CNN of ghanaweb) has disclosed details involving the incident. Just a little over a month in April, Ghanaians in Philadelphia mourned the sudden death of Mrs Mary Kusi-Appouh and now the whole community is in shock again in mourning the death of Margaret Owusu Sekyere affectionately called Adwoa Kwartemaa". On Wednesday, April 28th, 2004, after 11pm, Margaret was on her way home after work. At the traffic light, the intersection between Baltimore Pike and Church Lane in Upper Darby, PA, this unfortunate car accident occurred involving another vehicle and that is where she died. 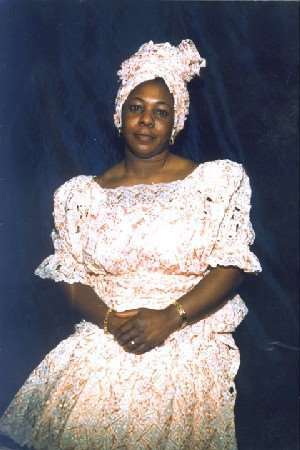 Funeral arrangements are being made and she would be flown to Ghana on June 1st for burial. She left behind a husband and two children. On behalf of Ghana's Home Page, Mr. CNN would like to express our condolences to her entire family. ADWOA KWARTEMAA, DAMIRIFA DUE, DAMIRIFA DUE NE AMANIHUNU! !